Deputy Attorney General Rod Rosenstein and FBI Director Chris Wray defended themselves against grilling by GOP lawmakers, including Rep. Jim Jordan, on Capitol Hill Thursday, facing off against House Republicans angry over the FBI and Justice Department's handling of the Hillary Clinton email and Trump-Russia investigations. Their appearance came as the GOP-led House voted along party lines on a resolution demanding the Justice Department comply with document requests and subpoenas from the House Intelligence and Judiciary Committees. Some conservatives have suggested the move could be the first of several actions taken against the Justice Department and Rosenstein – including, potentially, censure and impeachment. In one fiery exchange, Jordan, the pugnacious two-time NCAA champion wrestler from Ohio, accused Rosenstein of hiding information from Congress, and at one point appeared to taunt the embattled deputy attorney general minutes before the House Republicans voted to sanction the Department of Justice over GOP document requests. "I think in a few minutes, the House of Representatives is going to go on record saying you haven't complied with requests from a separate but equal branch of government, that you haven't complied with subpoenas, and you have seven days to get your act together," Jordan shot back, referring to the nonbinding resolution. "I am not keeping any information from Congress," a visibly irritated Rosenstein said, pointing his finger at Jordan. "I certainly hope your colleagues aren't under that impression, that is not accurate sir.". FBI Director Christopher Wray, left, and Deputy Attorney General Rod Rosenstein appear before the House Judiciary Committee on oversight of FBI and DOJ actions surrounding the 2016 election, June 28, 2018 in Washington, D.C.
Republicans and Democrats continue to spar over the findings of the Justice Department inspector general's report on the FBI's handling of the Clinton email investigation, which concluded that decision-making in the investigation during the 2016 election was not politically motivated, but that some individual actions of some agents damaged the FBI's credibility. As President Donald Trump has continued to criticize special counsel Robert Mueller's investigation – which is supervised by Rosenstein – Republicans have been increasingly at odds with the FBI and DOJ over the Justice Department's response to subpoenas for documents related to the Clinton-email investigation, the Russia probe and other actions involving the Clinton and Trump presidential campaigns. "It's really all about getting to the heart of any matter and transparency," Rep. Mark Meadows, R-N.C., a leading conservative, said ahead of the hearing. 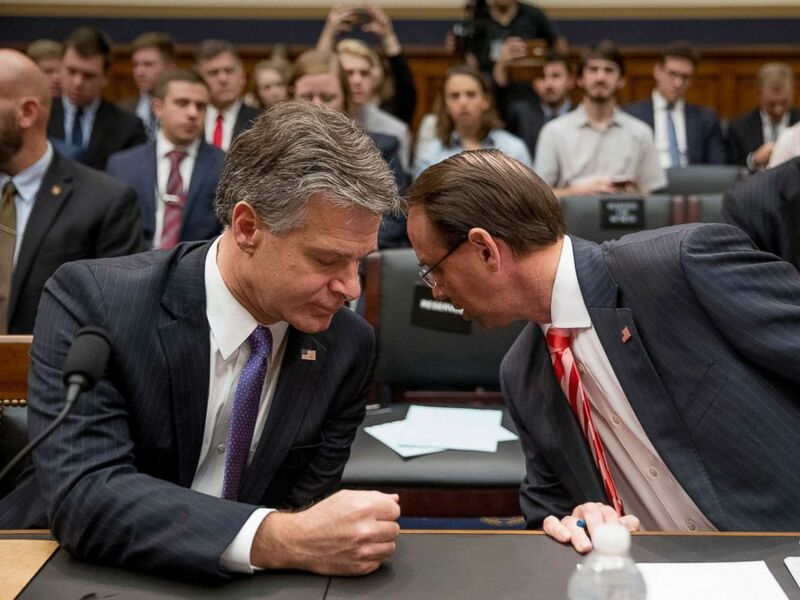 FBI Director Christopher Wray, left, speaks with Deputy Attorney General Rod Rosenstein during the start of the hearing on the Justice Department and FBI actions around the 2016 presidential election, June 28, 2018, in Washington, D.C.
Democrats have accused Republicans of making unreasonable document demands tied to the ongoing Russia investigation, as part of a larger effort to discredit the Justice Department and Mueller's investigation. "This is part of a sustained, coordinated effort to undermine the investigation of Robert Mueller and the work of the FBI and the Department of Justice, to attack the credibility of the investigators," Rep. David Cicilline, D-R.I., a member of the Judiciary Committee, told ABC News. On Wednesday, the House Judiciary and Oversight Committee questioned FBI agent Peter Strzok for more than 11 hours behind closed doors. After five and a half hours of testimony, House Judiciary Committee Chairman Rep. Bob Goodlatte, R-Va., adjourned the hearing. Asked whether the FBI has a “Deep State,” director Chris Wray struggled to answer the question because he doesn’t understand the term, he says. President Trump has invoked the existence of the “Deep State” – a reference to career intelligence and law enforcement officials who he says are seeking to undermine the Trump administration – on Twitter. Thursday afternoon, Rod Rosenstein denied the premise of Trump’s tweet. 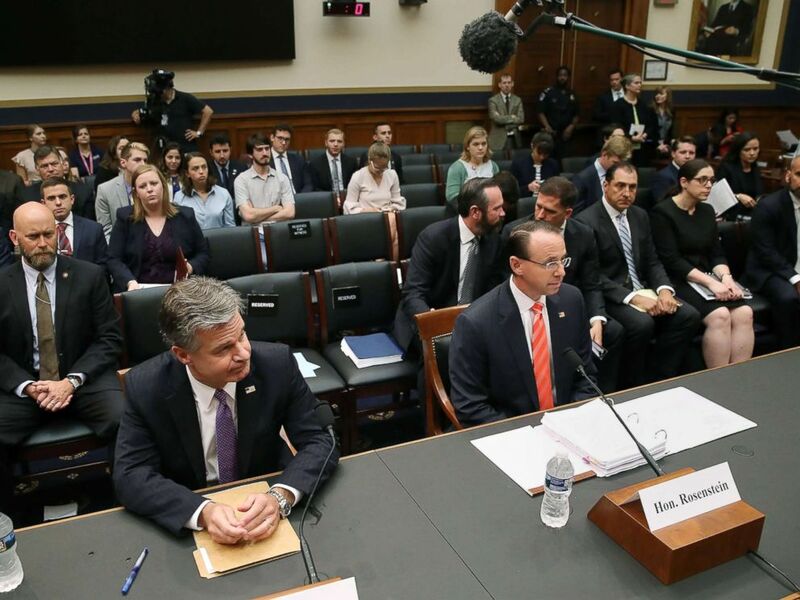 “I’m not a Democrat, and I’m not angry,” Deputy Attorney General Rod Rosenstein announced on Thursday in response to a question from Rep. Luis Gutiérrez, D-Ill.
As Thursday’s hearing got back underway – after a brief recess for votes – Rep. Ted Lieu, D-Calif., interrupted a line of questioning from Rep. John Ratcliffe, R-Texas, who was quoting testimony from FBI agent Peter Strzok, who sat with the committee for over 11 hours on Wednesday. “Release the transcripts,” Rep. Lieu said repeatedly, bringing Rep. Ratcliffe’s line of questioning to a halt for a couple of minutes. “The American people deserve to see the transcript,” Rep. Lieu said, accusing his Republican colleagues of “hiding” Strzok’s testimony. Eventually, committee chairman Rep. Bob Goodlatte, R-Va., said the transcript would be released at some point and asked Rep. Lieu to stop interrupting. Late Wednesday, Rep. Elijah Cummings, D-Md., in a joint statement with Rep. Jerry Nadler, D-New York, the top Democrat on the House Judiciary Committee, called on the chairmen of the House Judiciary and Oversight Committees to release the full transcript of the unclassified interview with Strzok. The House, in one of its last votes before the July 4th recess, approved on Thursday a resolution "insisting" the Department of Justice "fully comply" with the GOP document requests and subpoenas for information related to the Clinton email and Trump-Russia investigations. The resolution was adopted along party lines, in a 226-183 vote. Rep. Justin Amash, R-MI, voted present. Conservatives said the vote is a first step to force DOJ to comply with document demands - which Rosenstein and Wray have said they are complying with. Republicans have suggested that they will take additional steps, such as attempting to hold Rosenstein in contempt of Congress or even impeaching him, if they don't receive the requested information by Friday, July 6th. "If we don’t get the documents it’s not going to stop with a resolution on the floor," Rep. Mark Meadows, R-NC, warned. Democrats argue that Republicans are making unreasonable demands in an effort to undercut DOJ and the Mueller investigation and aid Trump's legal defense. "This is not oversight, this is collaboration with the executive," Rep. Adam Schiff, D-Calif., said on the House floor. During the testy exchange with Jordan, Rosenstein went on to describe the team he has put together - led by U.S. Attorney John Lausch from Illinois - to respond to document requests from Congress. Earlier in the hearing, Wray said the FBI has produced 880,000 pages of documents to Congress and has "substantially complied" with requests. An animated Jordan continued jabbing Rosenstein, who struggled to respond over Jordan's shouts. At multiple points, Democrats on the panel cut in to demand that Republicans give Rosenstein a chance to respond. "Mr. Jordan, I am the deputy attorney general of the United States. Okay? I'm not the person doing the redacting. I'm responsible for responding to your concerns as I have," Rosenstein said, adding, "Your use of this to attack me personally is deeply wrong." Rosenstein withstood attacks from Republicans who called for him to recuse himself from overseeing the special counsel Robert Mueller’s Russia investigation. "You wrote the memo writing that Comey should be fried, you signed the FISA extension for Carter Page,” Rep. Ron DeSantis, R-Florida, told Rosenstein, “seems like you should be recused from this more than Jeff Sessions because you were involved in making decisions affecting both prongs of this investigation. Why haven't you done that?" Rosenstein quipped, "I can assure that were it appropriate to be recused, I would be more than happy to do so and let someone else handle this. But it's my responsibility to do it." DeSantis, a Harvard Law School graduate, then questioned the premise of the Mueller investigation's focus on potential obstruction of justice. "How do you have an obstruction of justice possibility for a president expressing his powers and firing an FBI director you said should be fired? Desantis asked. “Why are we still doing this with the Mueller probe?" As the hearing got underway, House Judiciary Committee Chairman Bob Goodlatte, R-Va., expressed concern about the findings of the Justice Department inspector general's report, which Goodlatte said revealed "bias in the top echelons of the FBI during a hotly-contested presidential election." "While those on the other side of the aisle continue to exclaim that these biases are only personal, political predilections that had no effect on the operation of one of the biggest investigations in our nation's history, I wonder whether these same members would say the same if text messages had turned up to the tune of, 'Hillary is a disaster,' or 'We'll stop her,'" Goodlatte said, citing some of the text messages between FBI agent Peter Strzok and lawyer Lisa Page about Trump. Rep. Jerry Nadler, D-New York, the top Democrat on the committee, slammed Republicans for holding an "emergency" hearing Thursday while not doing the same for the administration's family separation policy at the border. "Today we meet so that the majority can criticize the deputy attorney general to his face, largely about his failure to produce documents that you know he cannot produce," Nadler said. "We will take a break so we can go to the floor and vote on a so-called resolution of insistence ... a measure that is without precedent ... and clearly a pretext for a move against Mr. Rosenstein that the majority has already planned."